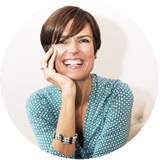 I have recently completed a 30 day Reset paleo diet, in a bid to get super healthy. Initially I struggled with removing sugar from my diet, however I found that these gingerbread bites were perfect to fill me up! If you are looking for a healthy lunchbox snack, these raw bites are loaded with good-fats and protein. 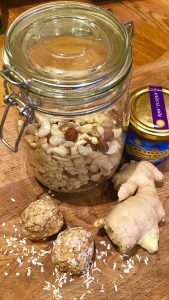 The good fats and protein from the nuts keep you feeling fuller for longer and the ginger kicks your metabolism into gear and fire up digestion. Almonds are full of Vitamin E, zinc which is excellent for your skin. Plus – if you add the scoop of protein powder, you’re getting a super nutritious snacks. For best results, use fresh medjool dates which are really gooey and have an amazing caramel taste when made into these bites. If you can’t find medjool dates, dried dates work just as well, but you will need to chop them into quarters and soak them in a little hot water for 5 minutes, then drain before using. You can also substitute 1-2 tablespoons of ground almonds instead of protein powder. Blend together until a sticky dough ball has formed. Roll into bite sized balls. ?Store in an airtight container in the freezer to keep on hand for anytime! Just take 1-2 out a few minutes to thaw a little before eating. 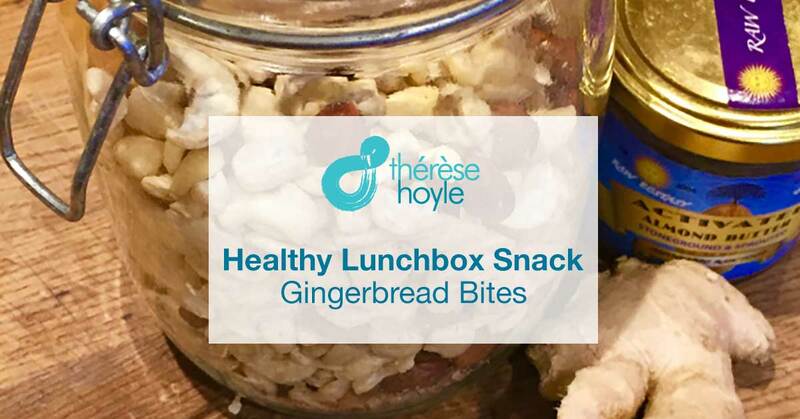 These will last for about 1-2 weeks in the fridge, or if kept in the freezer, about 6-8 weeks – perfect to keep on hand for quick lunchbox snacks!